I’ve been working on being more healthy, and one of the things I’m doing is trying to make better, healthier food choices. I don’t think it’s possible to keep up a fad diet. But I do think it’s possible to make good choices most of the time, and to make changes that can last. It’s not easy, but getting creative can help! That being said, sometimes, you just really want something sweet. This weekend when we were grocery shopping, we came up with an idea that I think solves that problem without totally blowing your calories for the day. 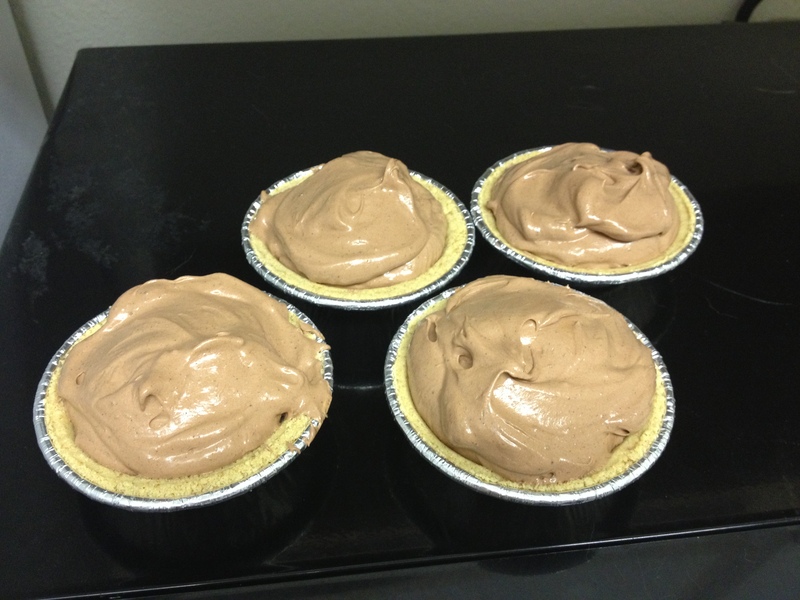 Give these mini-mousse pies a try! 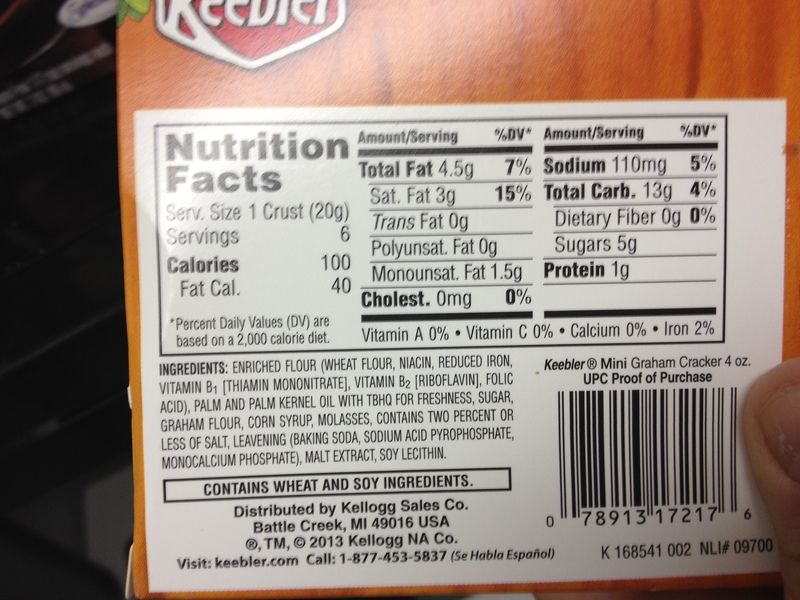 Follow the instructions on the chocolate mousse mix box. Refrigerate for 2 hours, and enjoy! See how easy that is? SO easy! You only need three ingredients and three steps! 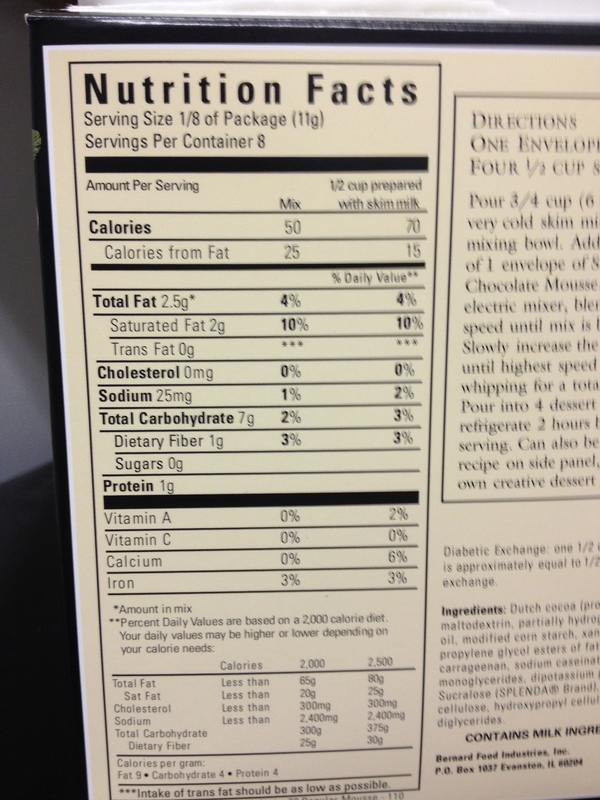 The finished product gives you four single-serving desserts that are under 200 calories… How awesome is that? Not only that, but if you’ve already got milk in your fridge, the other two ingredients will only cost you about $5 total. (And the mousse comes with two pouches, so it’s enough to make this dessert twice.) Even better, you can make these however you like. Feel like topping with some fresh fruit? Go for it! Maybe some chopped walnuts, coconut, mini-chocolate chips, or almond slivers… Go crazy! 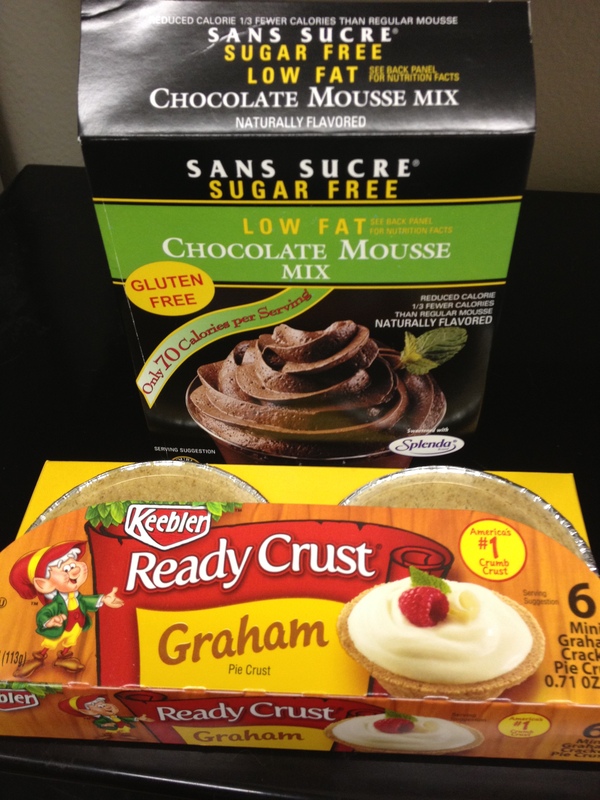 You can also use different flavors of mousse or even sugar free or low fat pudding mix (though the instructions, ingredients, and nutrition information will change). So many possibilities, so easy, and so much better for you than going to Dairy Queen! Do you have any healthy snacks or desserts you love to make? Please share them in the comments! I’m always looking for new ideas! My grandmother used to make this for family dinners when I was very young, and my mom made it occasionally growing up after we moved away. Now, my generation, my cousins and I, make this for family gatherings and for fun. When I just need something deliciously comforting, this is the best easy thing to make. 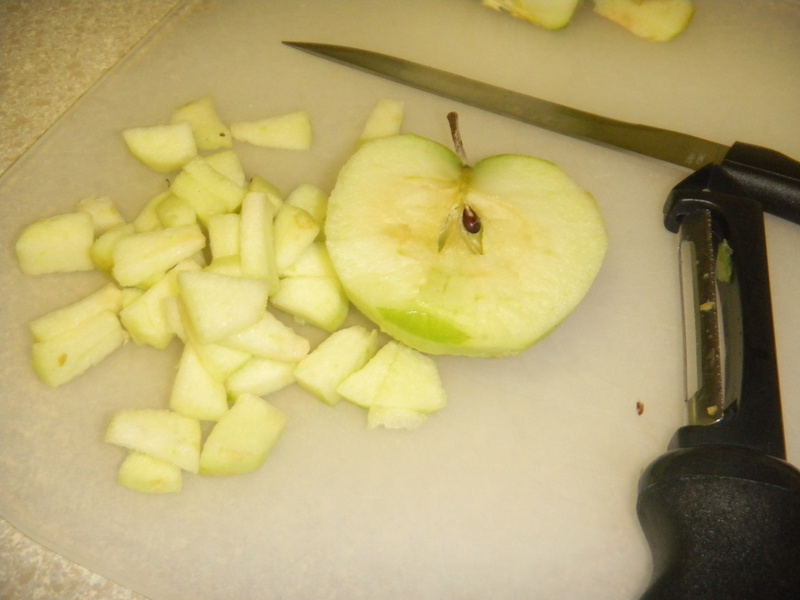 Peel the apples and cut them into small pieces. Dump them into your pot with cold water to keep them from turning brown while you work. 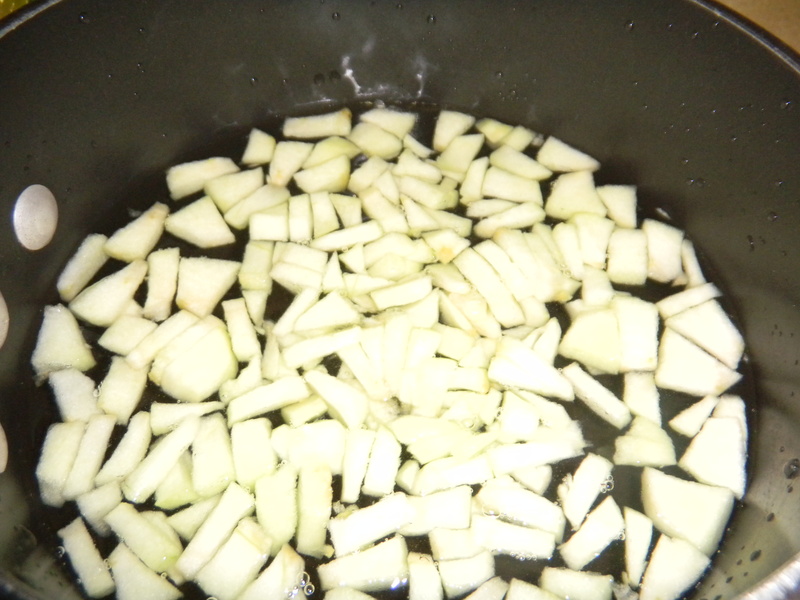 Boil and simmer the apples in the water until they are very soft. 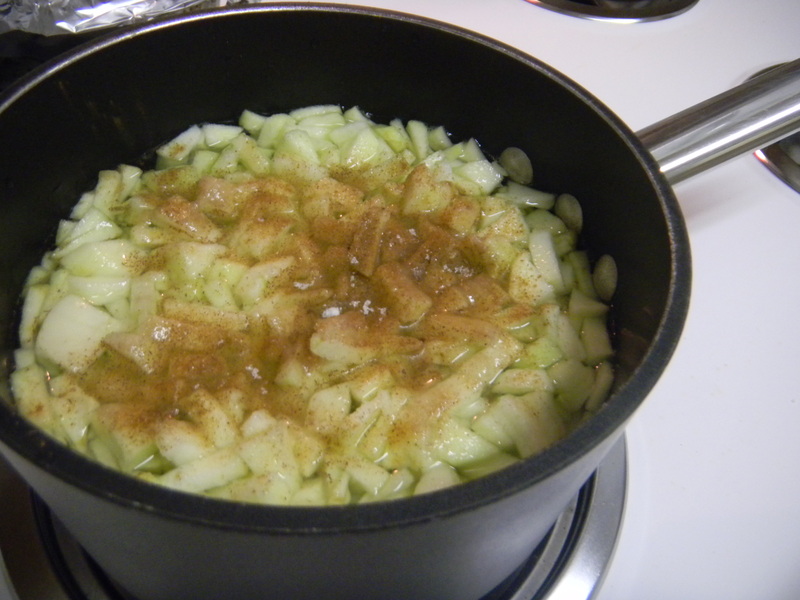 Add cinnamon to the mixture and let simmer another couple of minutes to let the apples soak up the flavor. Drain the water and smash the apples with a fork. I took them out of the pot I was using so I didn’t scratch it with the fork, but you don’t have to if you’re not using nonstick. 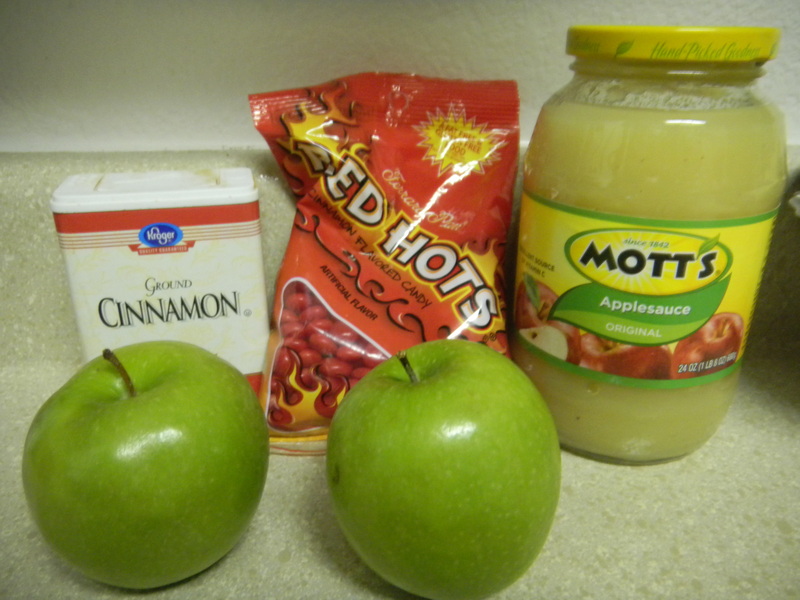 Mix the smashed apples, the jar of applesauce, and the entire package of red hots. 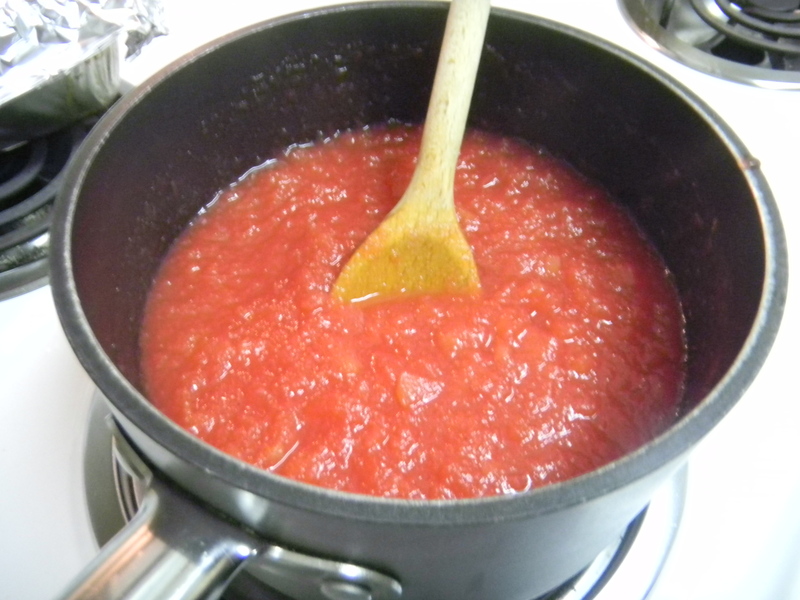 Simmer on low, stirring frequently, until all of the red hots are completely melted and incorporated. Add a little sugar at a time, to taste. 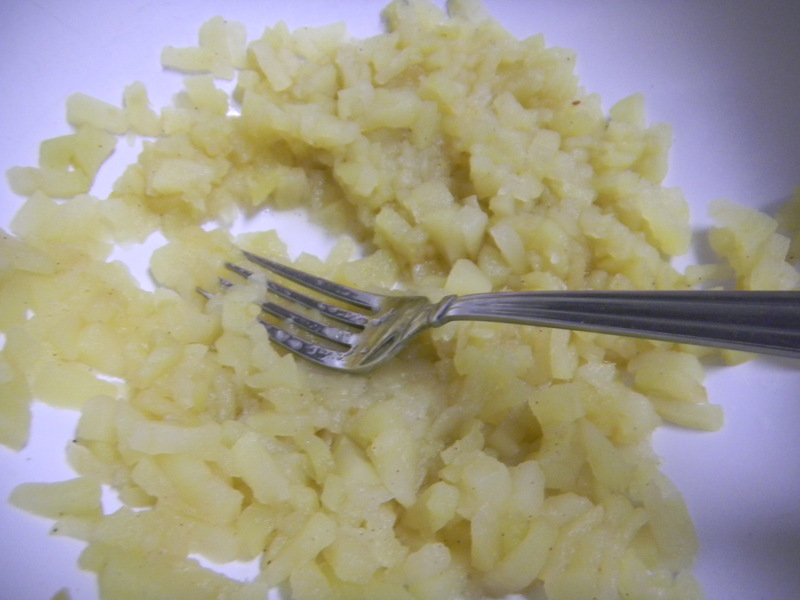 You may not need to add any at all, it just depends on the apples you used and the kind of applesauce. Stir, and viola! Chill in the refrigerator until it’s cold, and it’s ready to serve! This cinnamon flavored applesauce is absolutely one of my favorite things in the entire world. I hope you enjoy, too! Please feel free to comment with your favorite family recipes! One of the things that my dad loves to do for the holidays is make (semi) homemade pies. As the years have gone on, I have slowly added a little more help to the process, and this year, I made my first one on my own! Being far away from home can be hard. But bringing family traditions along can really help! 1 Position rack in bottom third of oven and preheat to 375°F. 2 Combine sugar, flour and spices in large bowl. 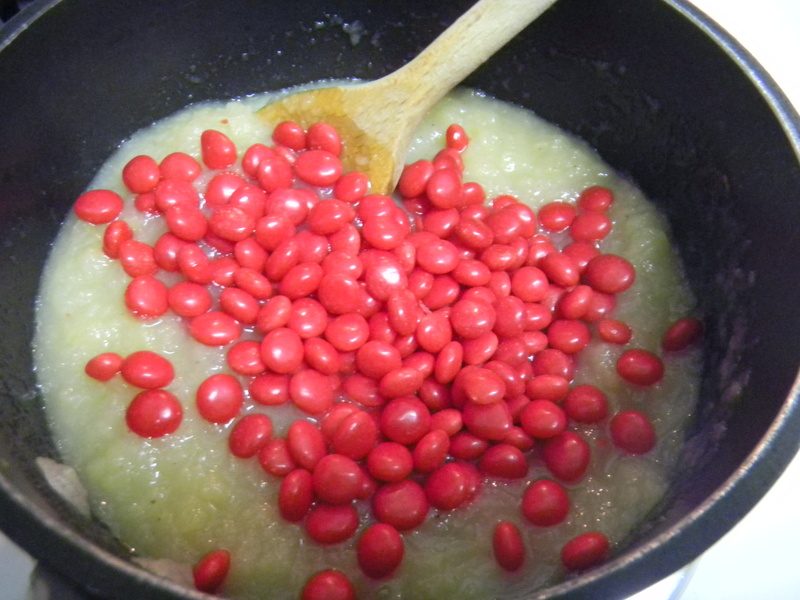 Use your hands and mix in the apples so they are well coated, then add vanilla extract. The reason that you use your hands to mix is so that you don’t break the apples down! This is actually pretty important. Also, it’s kind of fun! 3 Remove crust packages from the refrigerator. Let sit at room temperature for 5-10 minutes. Unroll one of the crust disks, and sprinkle some flour on top of the disk. Roll out a little bit with a rolling pin on a lightly floured surface to a 12 inch circle; about 1/8 of an inch thick (you really only have to make sure that the disk from the refrigerator is rolled flat and even, which isn’t always the case when you unroll it from the package). As you roll out the dough, use a metal spatula to check if the dough is sticking to the surface below. Add a few sprinkles of flour if necessary to keep the dough from sticking. Gently fold in half. Place on to a 9-inch pie plate, lining up the fold with the center of the pan. Gently unfold and press down to line the pie dish with the dough. 4 Spoon in apple filling, mounding slightly in center. I also recommend setting a little of the filling aside and leaving it in the refrigerator for a little while. It’s DELICIOUS. 5 Roll out second disk of dough, as before. 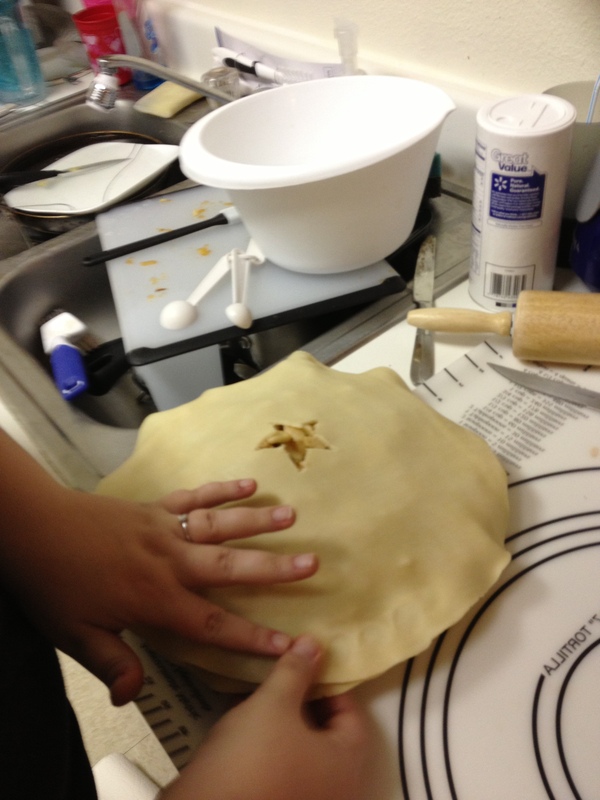 Use a cookie cutter or knife to cut a fun shape out of the center of the dough, or you can later cut slits in the top to allow the pie to vent as it cooks. 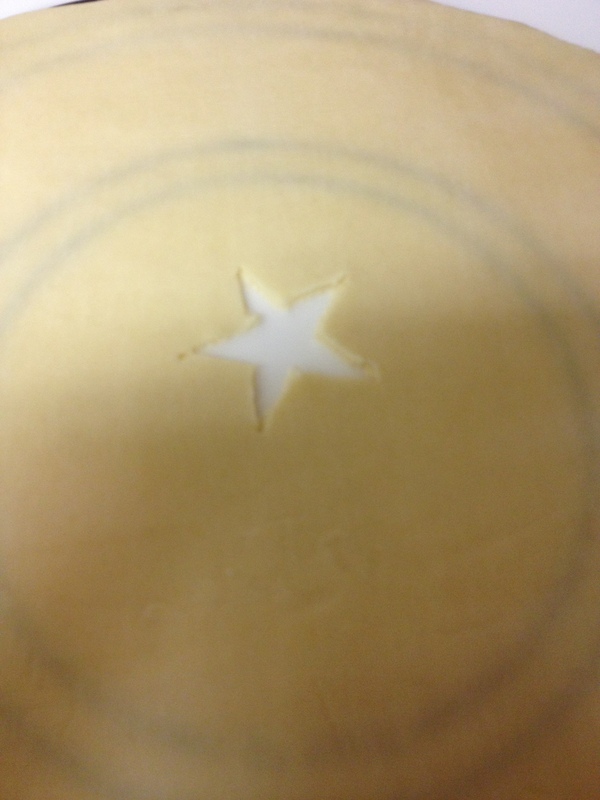 I used a knife to cut a star, but you can do whatever you want! 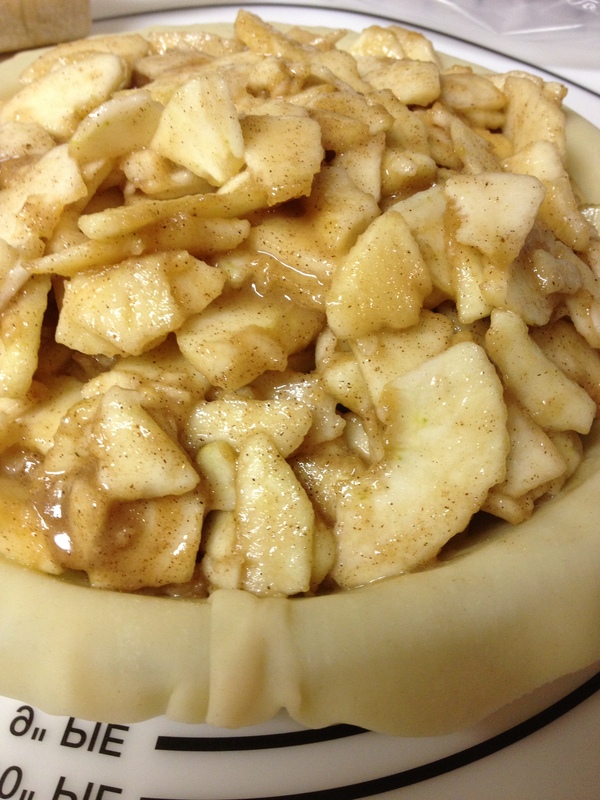 Gently turn over onto the top of the apples in the pie. 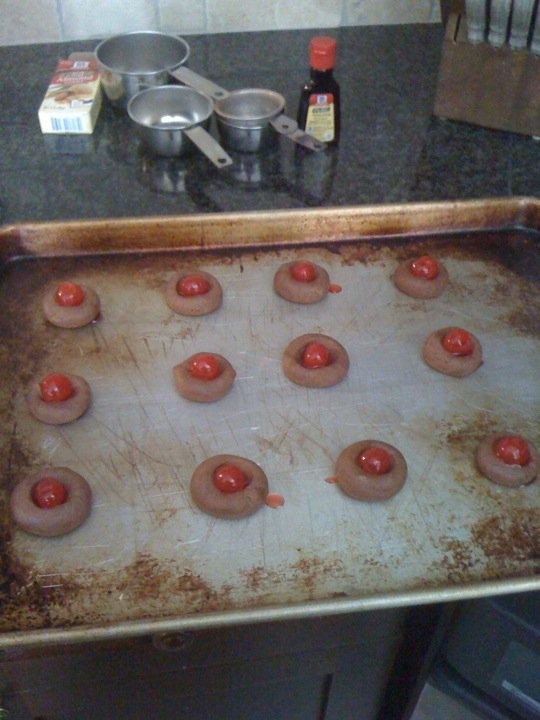 Pinch top and bottom of dough rounds firmly together. 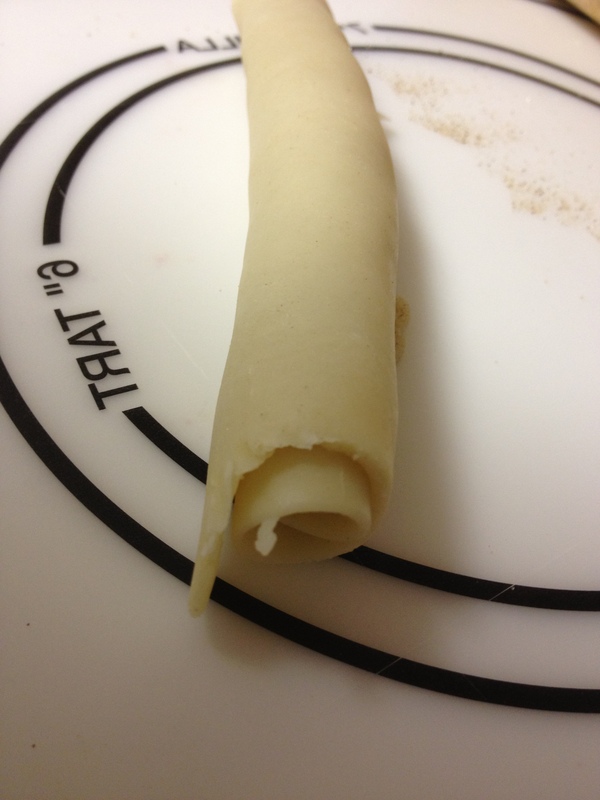 Trim excess dough with kitchen shears, leaving a 3/4 inch overhang. Set the excess aside. 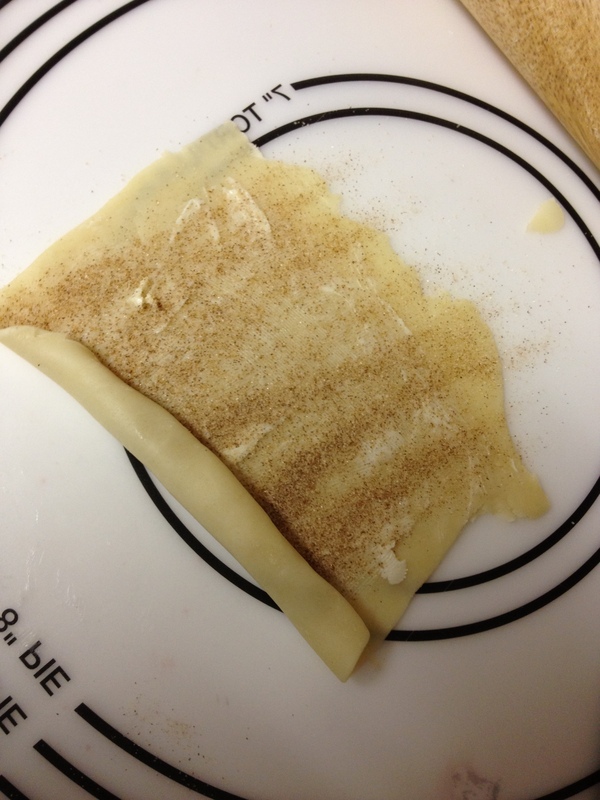 Fold dough under itself so that the edge of the fold is flush with the edge of the pan. Flute edges using thumb and forefinger or press with a fork. Okay, so I’m not very good at the “fluting the edges” part. It may not be very pretty, but it still tastes good, I promise! 6 Stir yolk and milk in small bowl to blend. Brush over top of pie. 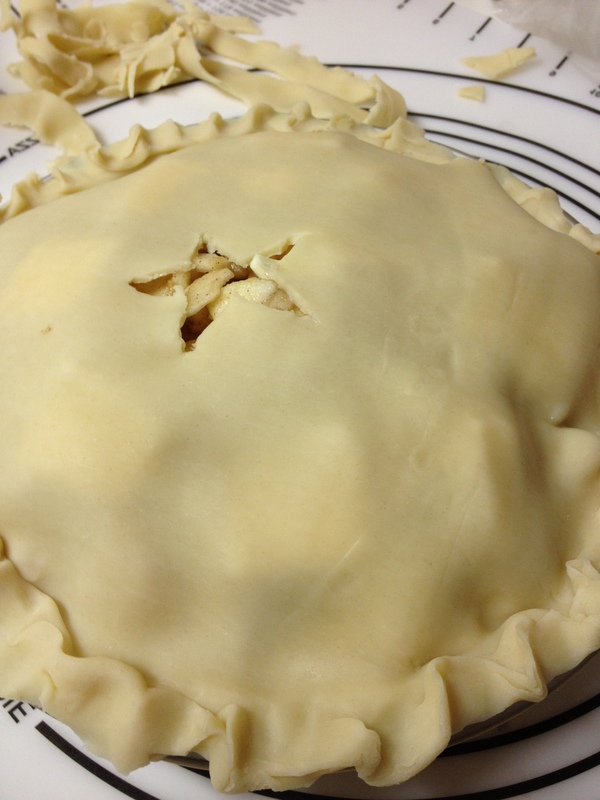 Cut slits in top crust to allow steam to escape if you didn’t cut a shape earlier. 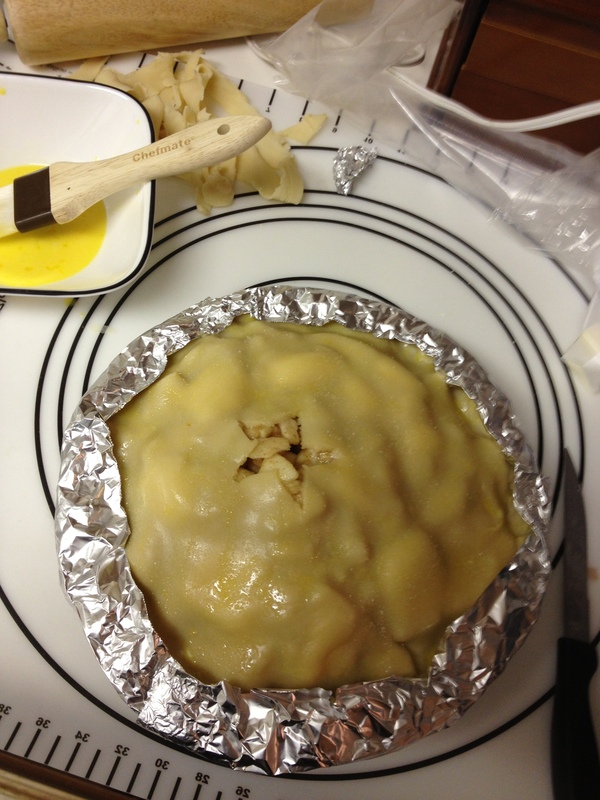 Bake pie until crust begins to turn golden, about 20 minutes, then reduce heat to 350°F. 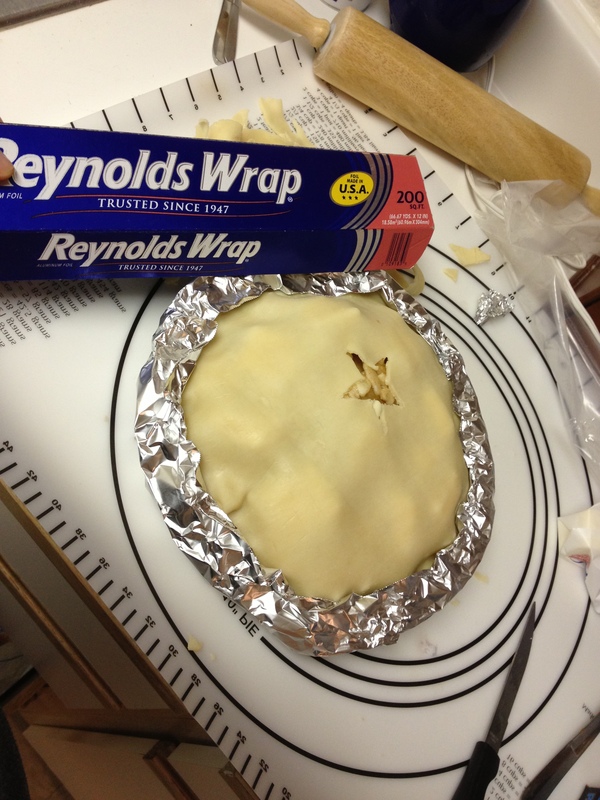 Tent the rims with aluminum foil or a pie protector if the edges are browning too quickly (they will, so make sure you do this!). Bake until crust is golden and juices are bubbling, anywhere from an additional 30 to 45 minutes, depending on the type of apples you are using. 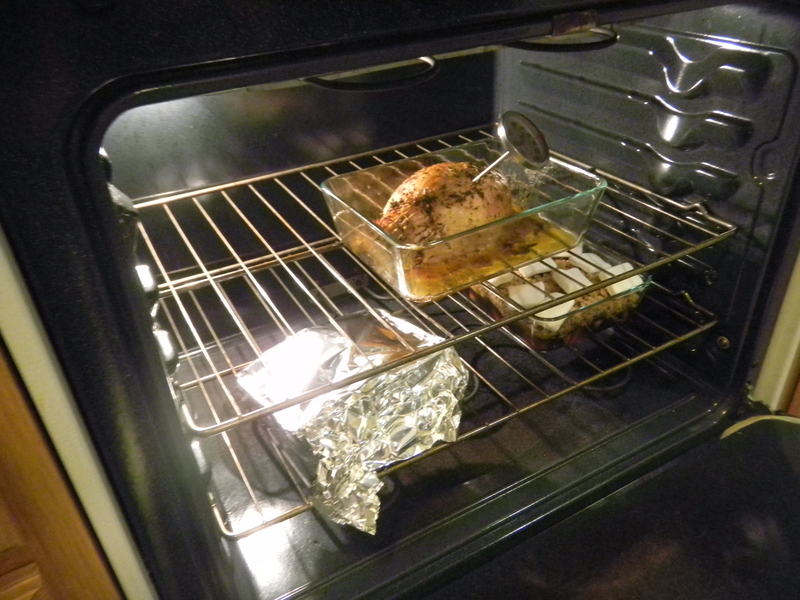 -OR- cover the edges with foil to protect them from burning until the last 5-7 minutes of cooking. The directions on the website are the first option, the second one is the one my dad and I use. I sprinkled a little bit of sugar on top after brushing on the egg wash. I don’t know, my dad always did it, so I did, too! 7 Transfer to rack; let stand 1 hour. 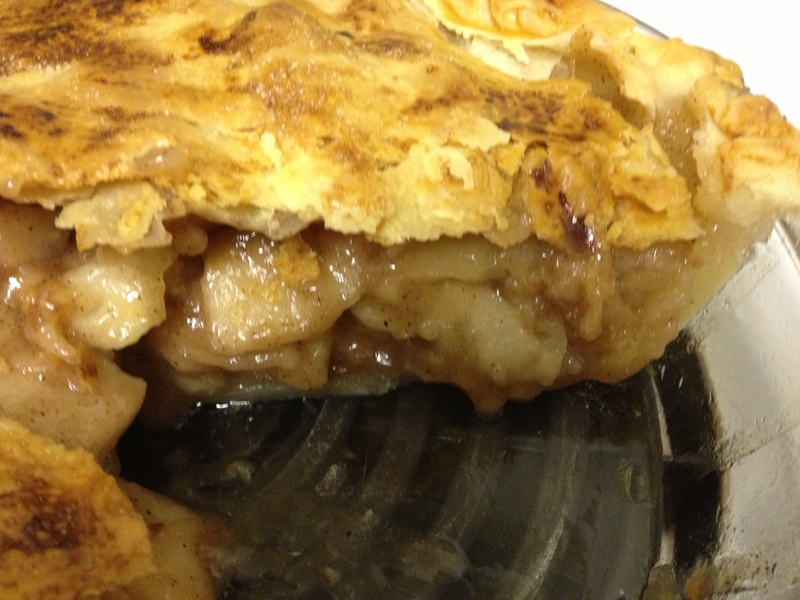 Serve pie warm, cold, or at room temperature. I wish you could have smelled this! Fresh apple pie smells so good! Okay, so remember the excess crust that you cut off? You know, the part I told you to set aside? I hope you listened, because I’m about to tell you something simple and delicious to do with it! 1. Roll the excess crust into a ball. 2. Use a rolling pin and a sprinkle of flour to roll the crust flat into a rectangular shape. If it’s not perfect, it’s no problem! 3. Spread a little butter over the top of the rolled out crust. 4. Sprinkle a generous layer of cinnamon-sugar on top of the butter. 5. 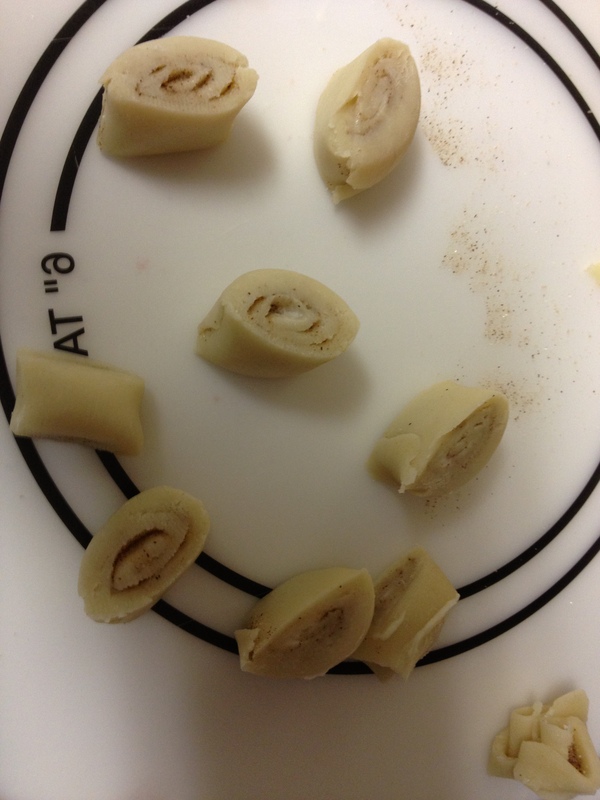 Sstarting at one end, roll the crust into a pinwheel. 6. 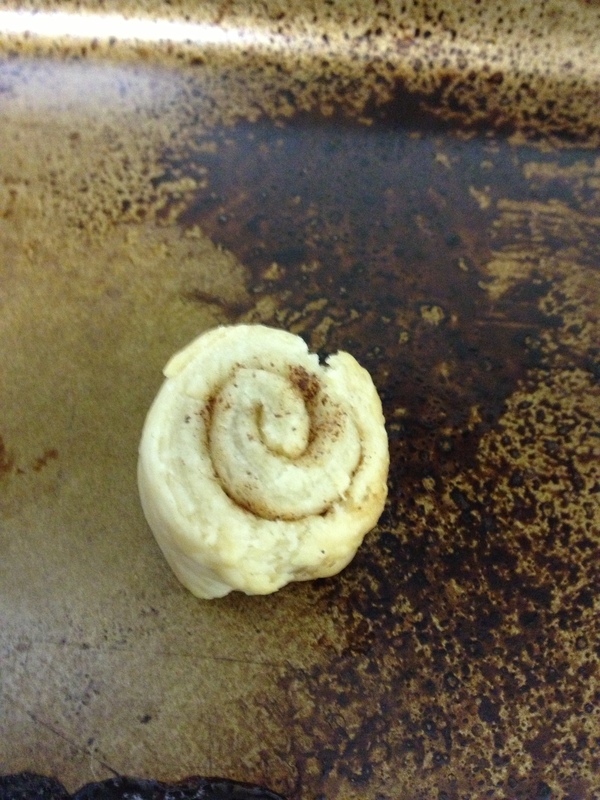 Slice into mini cinnamon rolls. 8. Remove from the oven, cool, and enjoy! All done! You can bake them a little longer if you like them more golden-brown, but be careful because the sugar will scorch to the cookie sheet if you leave them too long! So there you have it! Homemade apple pie and mini cinnamon rolls, all in one fell swoop! This was a really fun project for me because it gave me a good reason to keep in touch with my dad, and he was really happy to be able to help. Baking is something that we have always both enjoyed, so it is fun to be able to bond over it, even if we’re on opposite sides of the country. 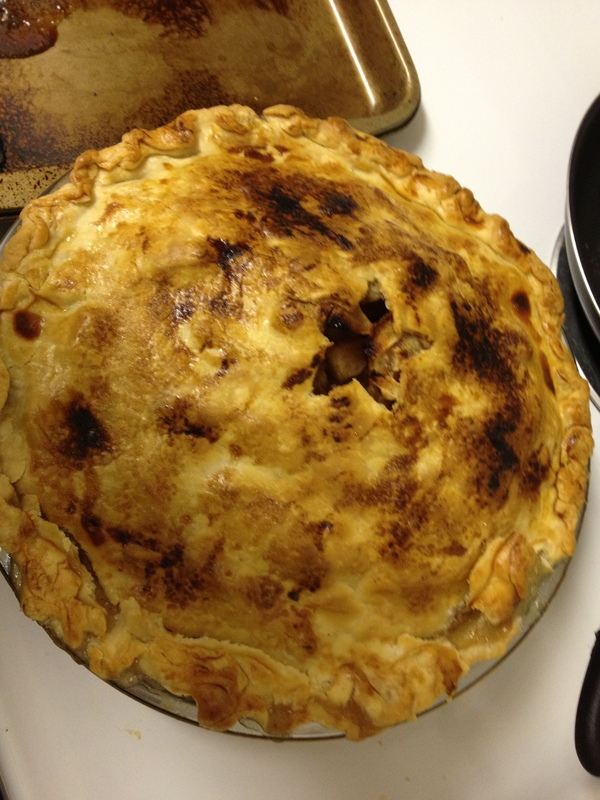 Also… the pie was DELICIOUS. Like… really yummy. AND the house smelled amazing for days! I call that a success! What are some of your favorite family fall traditions? Please share them in the comments! Peanut butter, banana, and whipped cream. The boy said it was delish! 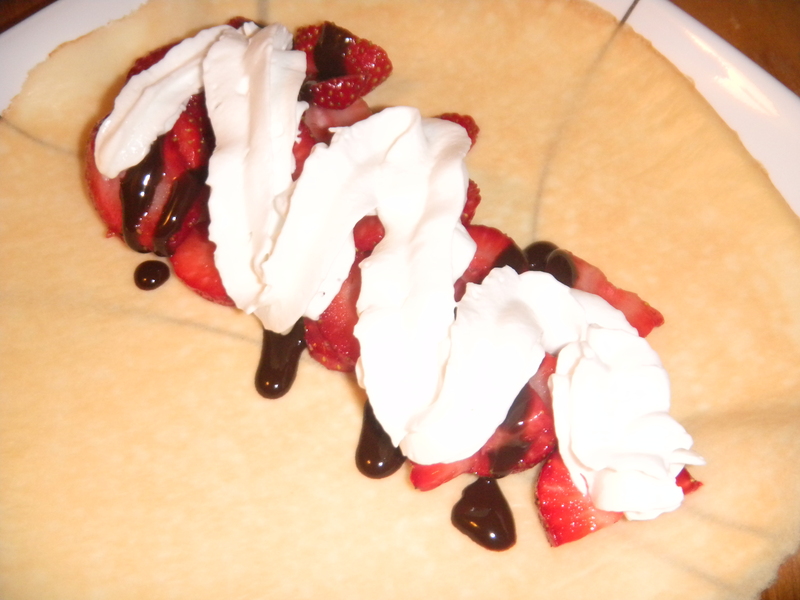 Strawberries, chocolate syrup, and whipped cream... yummy! We’ve been trying to eat more healthfully, which isn’t always easy when you have the crazy schedule of a law student. Sometimes, the easy healthy foods get boring, which makes it harder to stick to the plan. 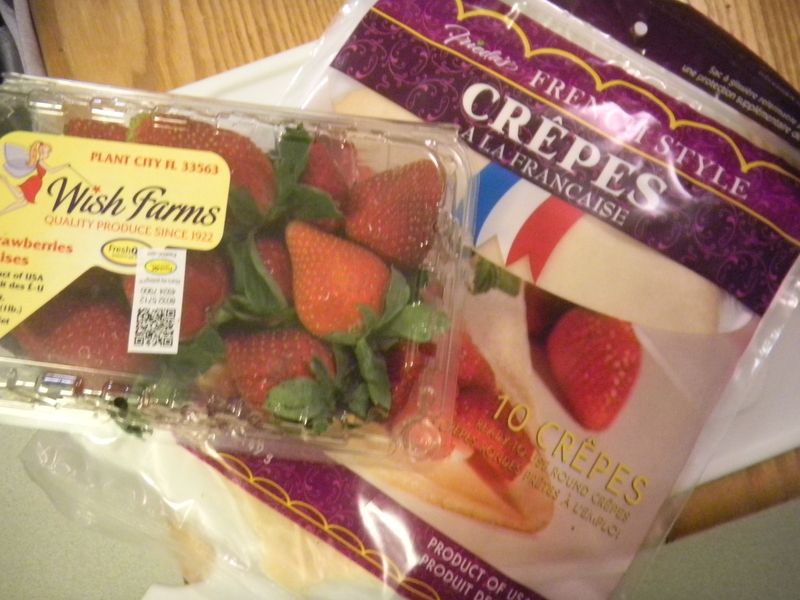 We found these pre-made crepes in the grocery store this week, and I thought JACKPOT! 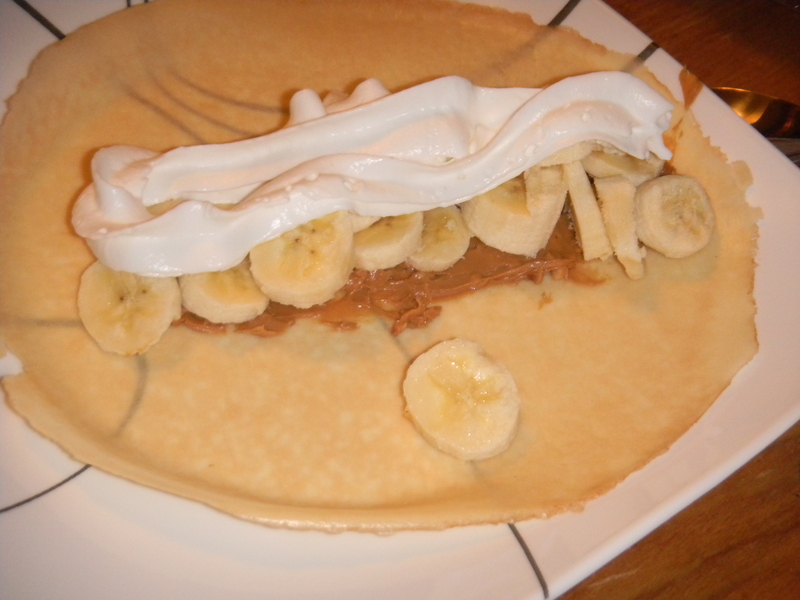 You can fill crepes with so many wonderful things, and these are only 50 cals each! Lucky for us, fresh strawberries were on sale this week, too. 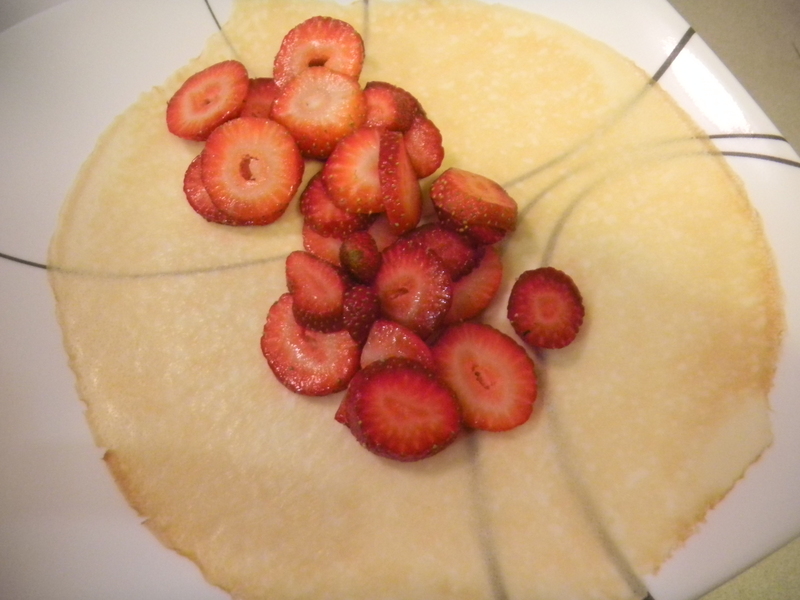 So I made the executive decision that strawberry crepes would be a fantastic healthy, delicious, easy dessert! Ingredients for the best dessert! 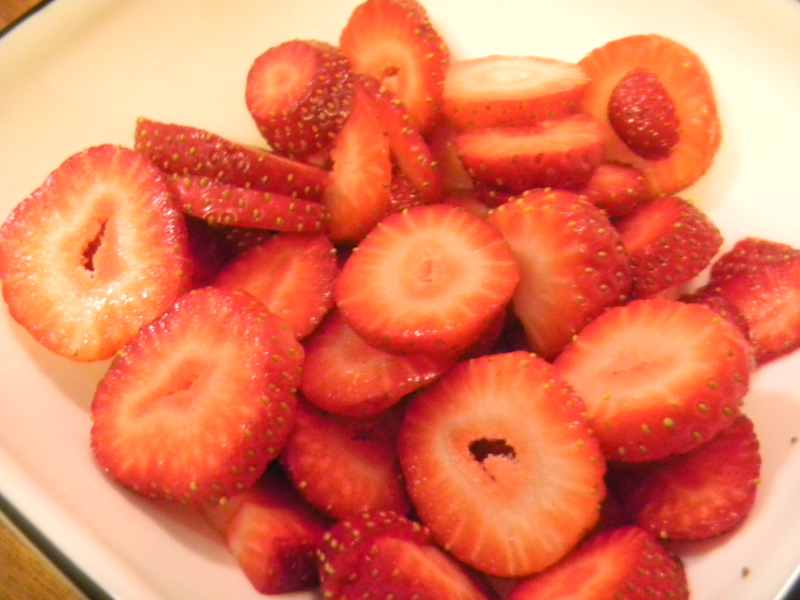 Wash and slice the strawberries and place them in a bowl. CAREFULLY remove one of the crepes from the package. They’re delicate, so take your time. Place it on a plate. 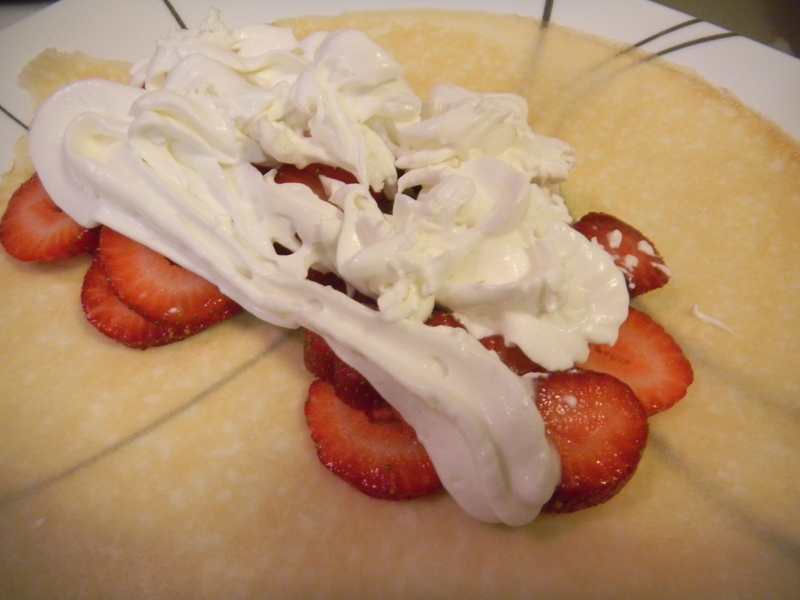 Add the strawberries to the center of the crepe, like you would add ingredients to a burrito. Top the strawberries with some lite whipped cream. 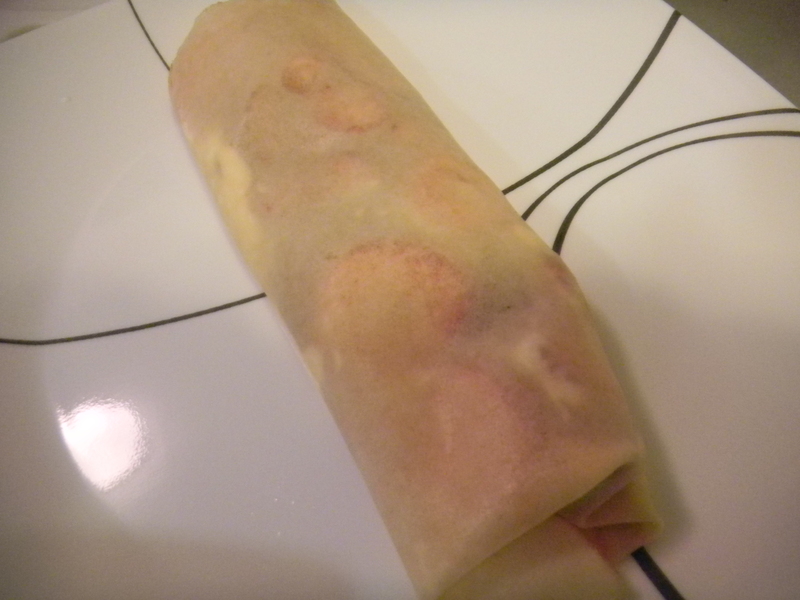 Carefully fold the crepe into a burrito, and enjoy! You can stuff the crepe with just about anything you can think of! Try different types of berries, other fruits, nuts, chocolate syrup, lemon curd (which is AMAZING if you’re not worried about the calories), or whatever else you can think of! You can also use these pre-made crepes for savory dishes, similar to sandwich-style wraps. Probably my favorite combination for crepes is mixed berries (strawberry, blueberry, and blackberry) with lemon curd… mmm yum! I hope you enjoy this idea, and please let me know if you come up with any good fillings! I’d love to try some new ideas! 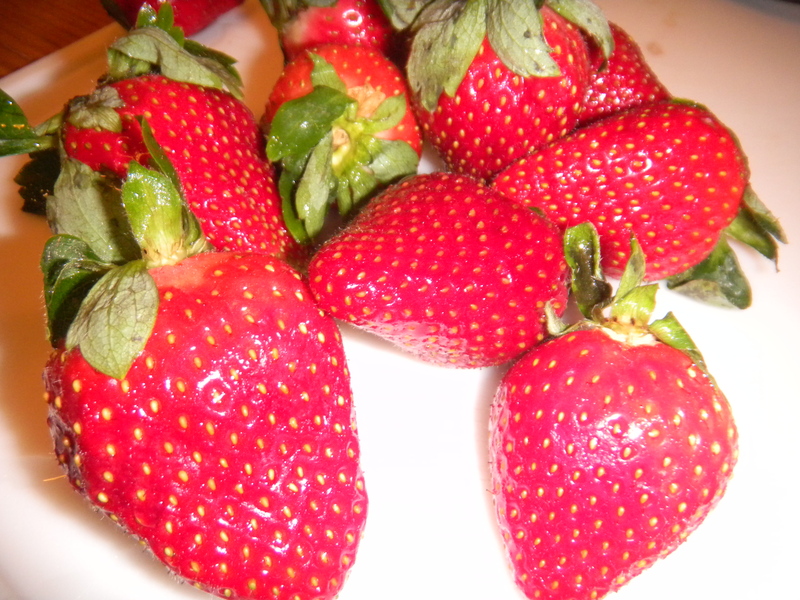 Fresh strawberries are so beautiful! YUM! I could eat them just like this! Make sure to leave space at the bottom to fold it up. Top with whipped cream... YUM! Last year I tried an old recipe for the first time on my own. The cookies turned out great! They were delicious and not all that difficult to make. I admit that they were time-consuming and didn’t make a whole lot in a batch. But, they are totally worth it! 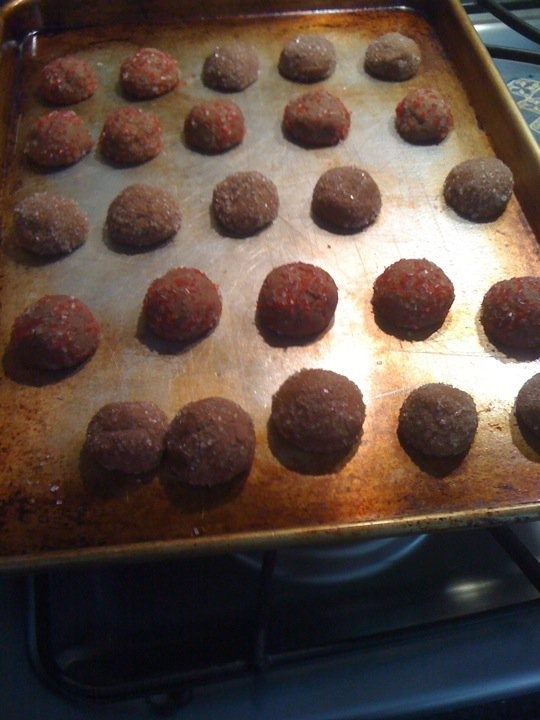 I did half the batch as chocolate “snowballs” rolled in peppermint sprinkles and half as “thumbprint” cookies with maraschino cherries in the middle. For the cherry ones, I also spooned a bit of the cherry syrup/juice into the indent around the cherry to add a little extra flavor. I can’t wait to make these again once I’m home and have a decent kitchen! Thumbprint version with maraschino cherries. You can find the recipe I used online at this link. We had it from an old magazine that we had ripped the page out of years ago, so I’m glad I can find it online, too! The best part about it is that you can make a lot of different shapes and variations with the same recipe because the dough holds its shape once baked. The link provides a few options, but I loved the ones I made. Once you make the dough, you can pretty much do whatever sounds good to you! PLEASE feel free to share any of your favorite cookie recipes! You can never have too many Christmas cookie recipes, and I am more than willing to try any new ones you recommend! Hope you enjoy! This year marked my fiance and my first Thanksgiving away from home. 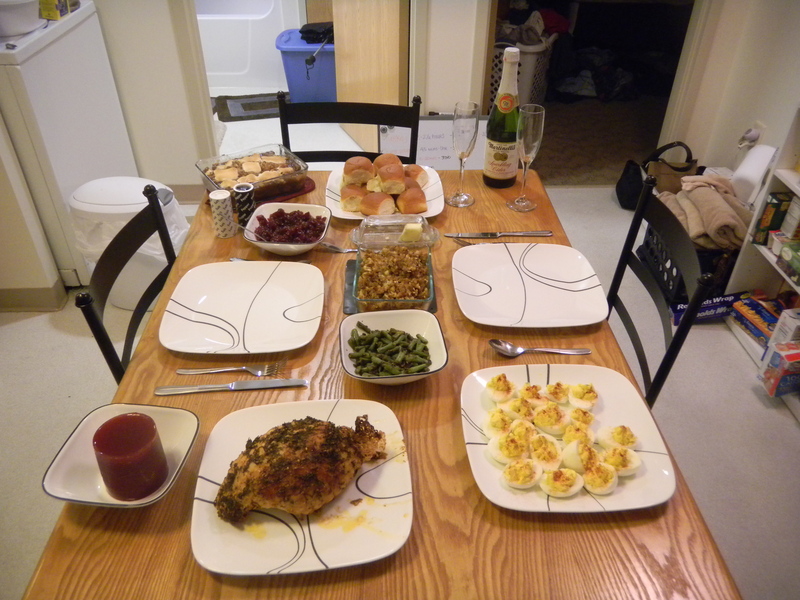 We toyed with the idea of just going out to dinner to make things easy, but we decided we’d make our first Thanksgiving dinner in our little apartment with no counter space. I could not be happier that we did! Not only did it turn out fantastically, but we will share this memory forever. LOVE IT. 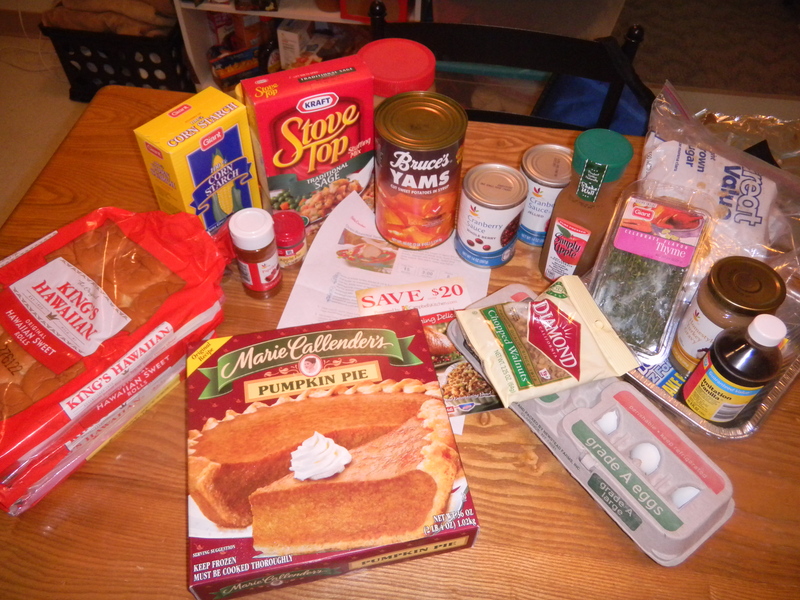 Here's all of our feast ingredients! 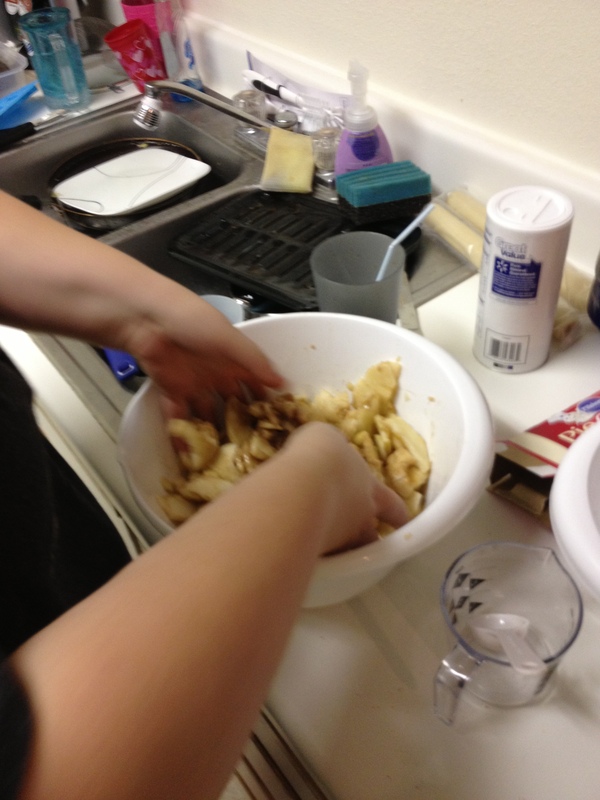 Im sharing a few photos of our wonderful dinner and the process of getting to it. 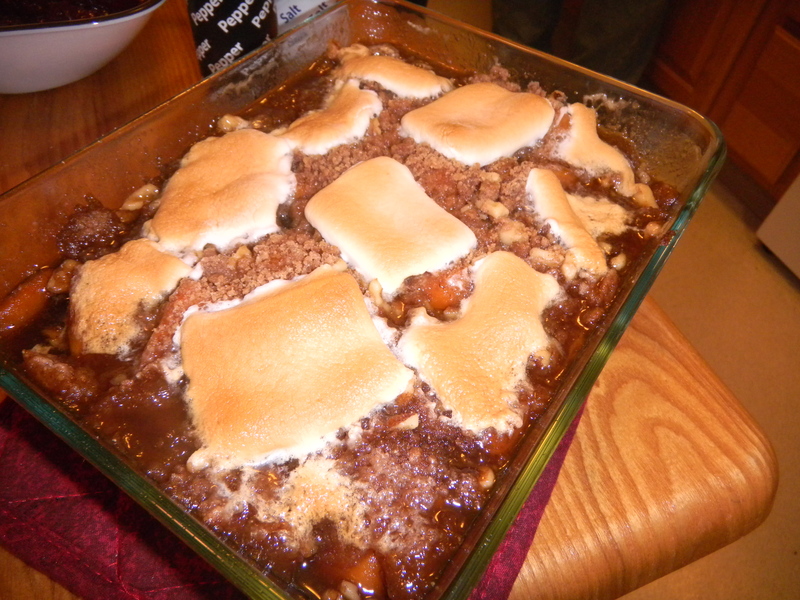 At the end of this post, I’m also including the recipe for the sweet potatoes that I made. My mom sent me her recipe, and they turned out AMAZING. They just might have been the biggest hit of our dinner! Thanksgiving dinner, Robert Irvine style! 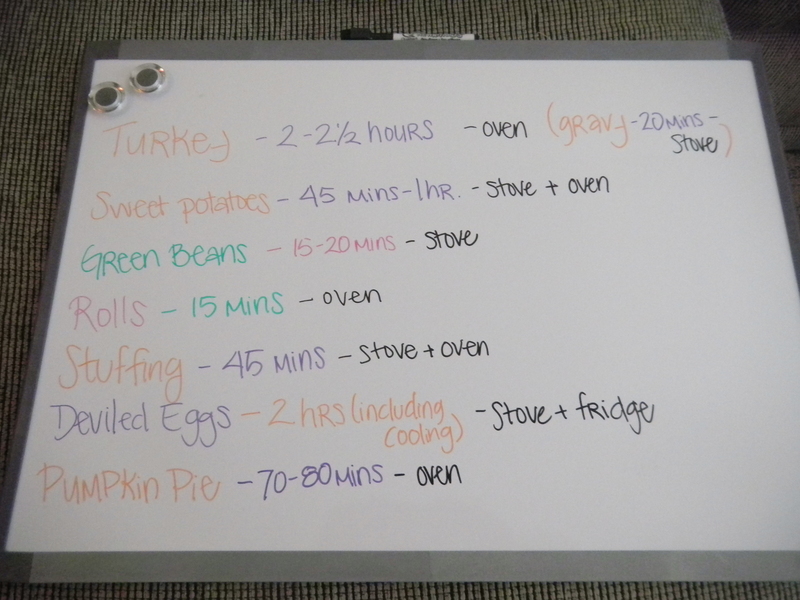 Turkey, stuffing, and sweet potatoes in the oven! Thanksgiving table, set and ready! Now, for the sweet potatoes! Preheat oven to 350 degrees. Warm brown sugar, 1/4 stick butter, a little water, maple syrup, vanilla, and pumpkin pie spice in a saucepan over the stove. Let this mix simmer (stirring frequently) until all of the brown sugar and butter are completely melted and combined. Grease a baking dish (I used Pam) and pour drained sweet potatoes into dish. Pour the brown sugar mixture over the sweet potatoes into the pan. For the topping, combine 1/4 cup softened butter with flour and cinnamon. Blend together with a fork. If the mixture is not lumpy, add some more flour until it is. (You want this to be a “crumble” type topping). Once combined, mix in the walnuts. Sprinkle the topping over the sweet potatoes and brown sugar mixture. Place a few marshmallows on top. Bake at 350 degrees for 30 minutes, and enjoy! I hope that you all enjoy this recipe, I know we sure did! Please feel free to share any of your favorites, too!